I had seen Wolves less than a mile from where I took this photo, so I came back to look for this old skeleton of a Bison during the next couple of days, thinking the Wolves would find and kill her. About three days after I took this photo, I saw several Magpies landing near an irrigation ditch. When I investigated, I found the this Bison had managed to get into the ditch and then could not get out and had died there. This part of Grand Teton National Park was once a working ranch and it has ditches in various places on the property. I always check for dead animals when I see Ravens or Magpies on the ground. I should say that I "carefully" check on them, because this is Grizzly country and where you see Magpies or Ravens there is often a Grizzly Bear feeding on a carcass. I have been charged by Grizzlies on two occasions and it is not an experience that I would like to repeat. I returned to the area several times thinking the Wolves or a Grizzly would scavenge on the carcass and I would get some photos of them. Some Coyotes found her and consumed what little meat was on these old bones, but the Wolves and Grizzlies never found her, or if they did, decided there wasn't enough meat on her bones to interest them. Wolves have a difficult time killing bison because of their size and their herding instinct which presents Wolves with several dangerous adult Bison to confront if they want to kill one. 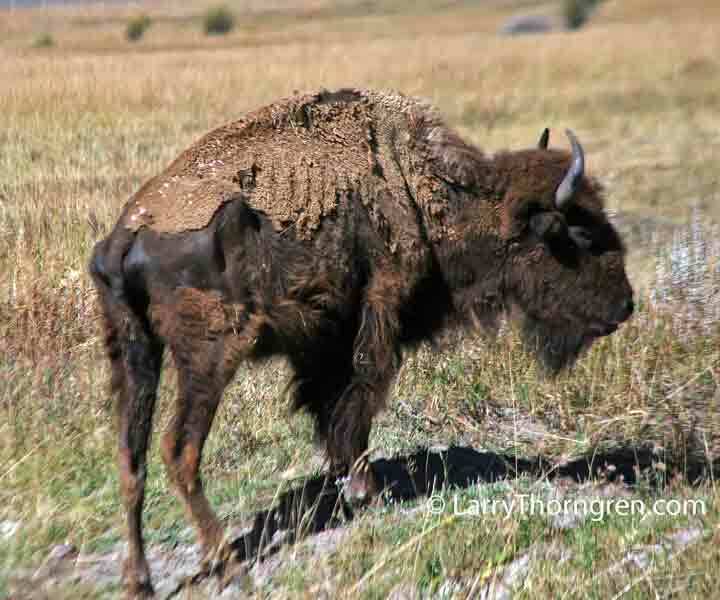 This old Bison would have been easy prey if the Wolves found her by herself. They very well may have checked her out and were not interested.